Traditional hummus recipes get a new twist with this flavorful version! 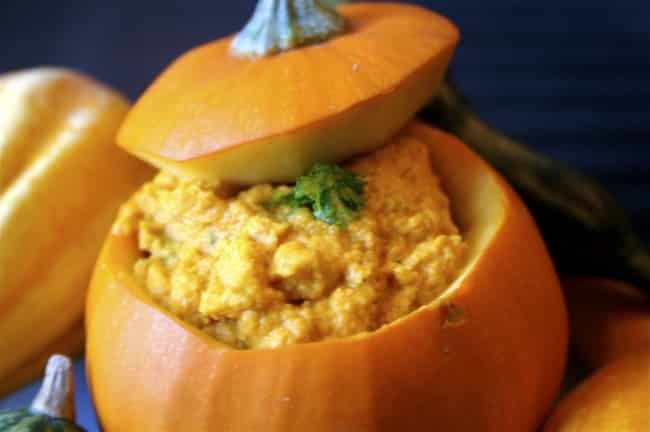 When I found this pumpkin hummus recipe, I was really excited to give it a try! I love hummus, and even though it’s good for you, it tends to be pretty caloric, which can really rack up those weight watchers points. This lower calorie version uses pumpkin instead of the traditional garbanzo beans, which helps you get more quantity in each serving than you would with your traditional hummus recipe. It doesn’t taste exactly like regular hummus, but the new taste is absolutely fantastic! Each serving of the Pumpkin Hummus Recipe has just a 2 Points, which isn’t bad. And I think it’s a really unique dip recipe that is ideal for any party or appetizer. Try serving with some 1 Point Pita Bread, or with some 0 point veggies! It also makes a great spread for sandwiches too! This hummus recipe has endless opportunities. Enjoy! what's the approximate size of each serving cup wise? thanks! this looks great! That, I don't know. The best thing to do is just to divide the recipe equally into 8 equal serving sizes. This way, you can store and save each individual serving size.